This is the story of our earliest efforts to build a dynamic advocacy organization to help the Chamorro people into what is now a full-fledged national presence with worldwide influence – the National Organization of Chamorro Veterans in American (NOCVA). Our journey to create a grassroots advocacy organization to help the Chamorro people started in the early 1990s. For nearly 25 years, we have worked to raise awareness about Guam and the Northern Mariana Islands — their political status as territories of the U.S. and how that status poses unique challenges for the Chamorro people. In terms of political power, not all Chamorros are equal; some have political power and some do not — it depends entirely on where they live. In fact, those who have political power often do not use it or realize how important it is. There is no doubt that Chamorros share a strong bond, no matter where they live. They are united by their ancestry and heritage; they care about their island, their history, their culture, their families, and their country. Chamorros are proud of their island identity and are deeply loyal and patriotic American citizens. Despite their unwavering loyalty to the U.S., however, the facts are clear: Chamorros living in the 50 states in the U.S. enjoy a different political status than their brothers and sisters living in the islands. We must understand and face this uncomfortable reality if we are to make progress on issues we care about. In the U.S., change doesn’t happen through wishful thinking. Change happens because citizens exercise political power to influence legislation to their benefit. As Chamorros, we need to understand how the U.S. political system works so we can use it to help ourselves and our people. Chamorros in the states — unlike their counterparts in the islands — can take full advantage of their political power by participating in the representational government of the U.S. political system. By uniting and working together, they can contact their representatives in Congress to influence legislation to their benefit. Armed with knowledge, Chamorros can build political clout so they can be more effective on long-standing issues such as war reparations and land claims; voting rights not only for citizens in the territories, but also for island delegates; appropriate services and entitlement benefits due to them, and many other issues impacting their health and well-being. Our history shows that we are not strangers to hard work and perseverance. We honor our ancestors and value our culture, often striving to leave a legacy for our children and grandchildren. If we are to make progress on issues we care about, we will need to come out of the shadows to shape our future. We must unite ourselves, learn about the U.S. political process, coordinate with each other to set goals, organize ourselves to leverage political power, and work together to realize our goals. This is the message that we have been trying to share with our Chamorro brothers and sisters for more than 25 years. To finally help us realize our mission and vision for a Chamorro advocacy organization, in September 2011, we created the National Organization of Chamorro Veterans in America (NOCVA). Our early efforts at advocacy involved writing papers that pointed out the disparity in the way that federal funds are disproportionately administered to Pacific Islander populations. Compared to the larger and more organized and well-funded Asian groups (despite the fact that we are often lumped together in the same category of “Asian-Pacific Islander”), Chamorro groups are spread out and unconnected, often unaware of each other’s existence. Further, grant money and funding available to Pacific Islander populations is often administered under the larger “Asian-Pacific Islander” umbrella, which often results in the larger groups receiving the largest amounts of money. Because the number of Chamorros is relatively small compared to other ethnic groups, we sought to build coalitions with various other Pacific Islander groups (Hawaiians, American Samoans, and other Micronesians) to maximize our political clout. Unfortunately, we soon found that even among Pacific Islanders, there are great differences in culture and need, making it difficult to create a “one-size-fits-all” approach to advocacy for all Pacific Islanders. Over the years, we reached out to Chamorros living in the islands and in the 50 states, civilians and servicemembers, active duty as well as veterans. Although we received a lot of encouragement, we weren’t able to make progress beyond our limited circle. Meeting with existing Chamorro social groups, we pointed out the need to establish an advocacy organization that could help us be more effective and get results. We explained the need for an organization that would be nonpartisan and nonpolitical, built from the grassroots. The organization would unite those on-island and nation-wide to advocate on behalf of all Chamorro people. The organization would use a multi-level strategy to organize Chamorros, regardless of where they lived, while leveraging the political power of Chamorros in the US to influence legislation that affects all Chamorros. Finally after years of trying, with limited success, to create an advocacy organization for the Chamorro people, an opportunity arose and a spark was lit. In August 2011, we met with a group of Chamorro veterans in Fayetteville, NC, to present our vision for establishing a national-level advocacy organization for Chamorros. This time, we suggested that Chamorro veterans lead the way. By focusing on Chamorro veterans, we discovered the key to generating enthusiasm for our cause. Veterans – a group of individuals already distinguished because of their skills, accomplishments, camaraderie, and national service experiences – have been instrumental in helping us develop an effective and cohesive grassroots organization to help Chamorros. Gratified and encouraged by the positive response from our meeting with the North Carolina veterans, in September 2011, we established ourselves as the National Organization of Chamorro Veterans in America (NOCVA), based in the nation’s capital, but working on behalf of all Chamorro veterans and their families worldwide. Although we decided to concentrate on Chamorro veterans in order to manage our scope, we made two important distinctions. First, NOCVA would work on behalf of all Chamorros – not just those from Guam but also those from the Northern Mariana Islands of Saipan, Rota, and Tinian (CNMI). Despite having different geography and political history, Chamorros from Guam and the Northern Marianas Islands share a common ancestry and heritage and often face similar challenges. Second, although NOCVA focuses on Chamorro veterans as an effective strategy to unite Chamorros, in reality, Chamorro veterans by culture are deeply connected to their families, their culture, and their islands. By serving Chamorro veterans and the issues they care about, NOCVA serves the Chamorro people. After meeting with the North Carolina veterans, we went to Killeen, Texas, two months later in October 2011 to meet with another group of Chamorros to again present our vision for establishing a national-level advocacy organization to unite Chamorro veterans. Again, the response we received was positive. During this time, from October 2011-February 2012, we began an intensive effort to take our message to the larger Chamorro community worldwide. With the help of family members, we created a website, launched in February 2012, that enabled us to spread the word about our organization. We adopted public relations strategies to communicate our message, in print and through electronic media. We established the foundation for our organization by drafting mission and vision statements, designing a logo, and formulating an organizational structure. We introduced the concept of creating a network of regional coordinators linking the 50 states and the islands and began to recruit volunteers who could help us reach out to Chamorros and build membership. We used our website at www.NOCVA.org to share information about our organization, posting our mission and vision, background about our founding members, and notices of upcoming events. By January 2012, we were invited to a roundtable meeting in January 2012 hosted by the Department of Veterans Affairs. For the first time, we took our place at the table where the larger and more active Asian and Pacific Islander groups typically sit. At that meeting, we were able to speak as Chamorros veterans ourselves and on behalf of all Chamorro veterans. At this event, we met VA Secretary General Eric Shinseki (U.S. Army, retired) and were involved in discussions about issues that affect Pacific Islander veterans. National organizations, especially the Department of Veterans Affairs, routinely reach out to minority groups to ensure that they receive the benefits and service due to them. 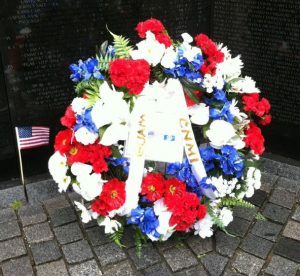 By February 2012, the group of Chamorro veterans from North Carolina, increasingly motivated and energized, committed themselves to conduct the first-ever wreath-laying at the Vietnam Veterans Memorial Wall in Washington, DC, that would honor the 70 servicemen from Guam and the Northern Mariana Islands who died during the Vietnam War. They organized and planned the ceremony and raised funds to cover costs. NOCVA assisted their effort by coordinating with the National Park Service, various national-level offices, and the Washington-area Guam Society of America to host the visiting Chamorro veterans. The coordinated collective effort resulted in a historic event on 24 March 2012— the first Chamorro Veterans Commemoration Ceremony at the Vietnam Veterans Memorial Wall in Washington, DC. This initiative was profoundly significant not only because of its deeply moving tribute to fallen Chamorro soldiers, but because it demonstrated the power of grassroots organizing for a common goal. United in their common bond as both veterans and Chamorros, the veterans from North Carolina have shown how a motivated group, no matter how small, can accomplish big things. The ceremony was initiated, planned, and conducted entirely by 15 Chamorro veterans working together on behalf of the Chamorro people from Guam and the Northern Mariana Islands. More than 50 people attended the solemn ceremony, which featured a reading of a memorial poem adapted to honor the island heritage of the fallen. The highlight of the ceremony was the recitation of all 70 fallen heroes’ names by the Chamorro veterans. The ceremony ended with the laying of a wreath at the center of the Vietnam Veterans Memorial Wall. The Chamorro Veterans Commemoration Ceremony was remarkable for being the first of its kind: a long-overdue memorial ceremony successfully undertaken by a group of motivated individuals on behalf of a larger group. As with other well-intentioned events, the experience was extremely gratifying for those who participated, attended, or heard about it later. Rather than being just a fond memory, however, the ceremony had an impact much greater than the event itself. Knowing that most Chamorros in the islands and throughout the U.S. would not be able to attend, NOCVA arranged for a videographer to record the entire ceremony. NOCVA then created a DVD of the ceremony that not only documents the event but explains its profound significance to the Chamorro people. This historical event is now available to anyone who wants to better understand the Chamorro people and the sacrifices they’ve made to this country. In May 2012, NOCVA’s DVD of the Chamorro Veterans Commemoration Ceremony was made available for general distribution. By watching the DVD, Chamorros who could not be at the event, because of distance, time conflicts, or other circumstances, could still have an opportunity to experience the ceremony. Since then, NOCVA has distributed copies of the DVD to numerous individuals and made copies available for sale through the NOCVA website. As a result of the ceremony, two more initiatives were developed: the “Chelu, We Remember You Project” and a special presentation in Guam by the North Carolina Chamorro veterans. The “Chelu, We Remember You” Project was undertaken by NOCVA in effort to contact each of the families of the 70 fallen soldiers from Guam listed on the Vietnam Veterans Wall. The purpose of the Chelu project is to recognize and honor the service of fallen Chamorro heroes, presenting each family with the original etching of their loved one’s name and a complimentary copy of the DVD of the Chamorro Veterans Commemoration Ceremony. NOCVA is committed to locating the families of all fallen Chamorro heroes to recognize the service of their loved ones. Another NOCVA initiative was carried out by the group of North Carolina veterans in July 2012. Coinciding with the Guam Liberation Day anniversary, Chamorro veterans from North Carolina presented two gifts to the people of Guam: the bell that had been rung in the first Chamorro Veterans Commemoration Ceremony in Washington, DC, and a plaque listing all 70 of the fallen heroes from Guam and the Northern Mariana Islands during the Vietnam War. The presentation was made at the Latte of Freedom Foundation in Agana, Guam. During this trip, the veterans also met with families of fallen Chamorro heroes as part of NOCVA’s “Chelu, We Remember You” project. As part of NOCVA’s ongoing efforts to recruit new members, we again reached out to Chamorro veterans in San Diego, CA, in June 2012,and Sacramento, CA, in August 2012. The response to our message continues to be positive, with many Chamorro veterans stepping forward, willing and eager to help build our organization. This type of grassroots participation is essential for us to succeed and spread the word about who we are, what we’re doing, and why we can make a difference if we work together. We continue to think strategically and develop initiatives that will shape us into a strong and effective advocacy organization. Although there are countless things we can do, given our limited resources, we need to decide which efforts will serve our mission and move our vision forward. NOCVA’s regional coordinators – in their position at the front lines — are critical to helping build membership and carry out the mission. Regional coordinators, working with members at the local level, are able to raise awareness about issues and concerns that need national-level attention, as well as initiate projects that will serve Chamorro veterans and, ultimately, the Chamorro people. With a vantage point in Washington, DC, NOCVA’s founding members and staff can help regional coordinators accomplish their goals. NOCVA can coordinate regional efforts, raise awareness about national and regional initiatives, and help maximize their effectiveness. With access to national organizations such as Veterans Affairs, NOCVA can work to influence policymakers on a variety of issues important to members. Having developed a good working relationship with officials from the Department of Veterans Affairs, NOCVA is in a unique position to address issues on behalf of Chamorro veterans in all 50 states, Guam, and the Northern Mariana Islands. In July 2012, NOCVA received a request from the senior policy adviser on Asian and Pacific Islanders under General Shinseki to provide input on health issues affecting Chamorro veterans. This request gave NOCVA the opportunity to provide valuable and specific information about issues important to Chamorro veterans. To fulfill this request, NOCVA reached out to Chamorro veterans for direct input. Through NOCVA’s regional coordinators and from Chamorro veterans themselves, NOCVA gathered specific information about their health-related issues. These comments and concerns were then collected and presented in a manner that will receive national-level attention. NOCVA has had an active and productive first year. All of us – the founding members, the staff, the regional coordinators, and many interested members in the islands and throughout the U.S. – are working to build NOCVA’s reputation as a strong and effective advocate for Chamorro veterans and the Chamorro people. We are proud of the accomplishments we have made in just one year and feel honored to be working with other Chamorro veterans to fight for the rights we deserve while developing new initiatives that will benefit our families, communities, and our people. We invite anyone who is interested in helping us build our organization to join us. We welcome your advice, ideas, and constructive feedback so that we can become an effective and responsive organization. We are committed to making NOCVA into the best and most effective advocacy organization serving Chamorro veterans and ultimately the Chamorro people.